This was a staple on New York's WOR-TV (9). The theme music was from Gone With the Wind. "The Million Dollar Movie"Show was Ted Malle' . Had no idea that's what RKO stood for! Thanks chrisbroz, I learned something. KHJ-TV in Los Angeles (also owned by RKO General) also ran the Million Dollar Movie. The announcer was Ted Meyers. But everything else was just the same as WOR-TV in New York. We would watch the same picture night after night at 7pm.. I loved Fred Astaire and Ginger Rogers or Yankee Doodle Dandy King Kong Mighty joe young those were the days!! My father would come in from work and could never understand why we watched the same movie over and over it was totally beyond him! Is "Tarantula" the one where Clint Eastwood zooms in out of nowhere and...[SPOILER ALERT]. I remember Agnes Moorehead as Steve's stunt double. Steve Reeves died??? But he was supposed to come over for pasta this Thursday. Well, crap. I remember as a very young child being so fascinated by a 'grown-up' movie called "Million Dollar Weekend" that I watched it over and over the entire week! Years later as an adult I'd think about that movie, wondering what could have held me so? But I couldn't remember a thing about it. Nobody I'd ask ever heard of it. Finally twenty or so years ago I took out a classified ad inquiring did anyone have it and could they put it on VHS for me? One reply -- yes! So after half a lifetime of wondering, anticipating all sorts of awakened memories, I got to watch my movie again but this time as an adult. What a letdown, I didn't remember it at all!! And here I was expecting it to fill in a missing piece of my life or something. Then years later it hit me. 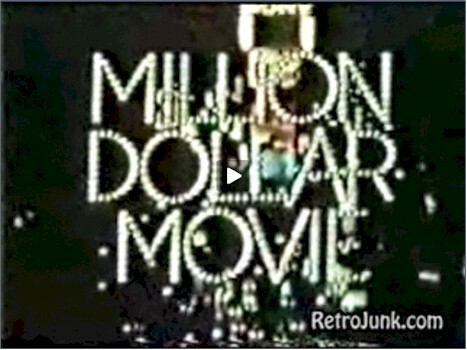 All it was was the fascination of watching a movie about a "million dollars" on "Million Dollar Movie." That was enough to hold a five year old. I always liked the horror stuff like, "Attack of the Crab Monsters", "The Black Scorpion", and "Tarantula". I watched "Queen of Outer Space" every day for one week straight. It starred Zsa Zsa Gabor. It is now a cult classic. Call me a rube, but I had no idea that Million Dollar Movie used the theme song from Gone with the Wind until I saw GWTW on TV when I was well into my 20's. I blurted out, "hey that's the theme song from Million Dollar Movie!" MDM typically ran one film and one film only for one solid week. I remember watching "Yankee Doodle Dandy" every evening that they were broadcasting it back in 1958 or so. Same for the original "King Kong" with Faye Wray and Robert Armstrong. "Staple" may be putting it mildly. Aside from the children's programs, it seems to me that I encountered MDM every time I switched to channel 9.